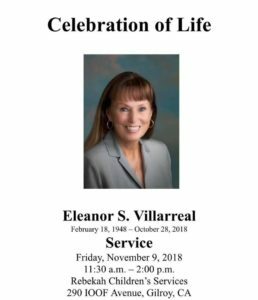 Eleanor Villarreal lived a life devoted to making Gilroy a better place for all. For family and friends, the longtime Gilroyan will be fondly remembered as a woman devoted to service in the South Valley. A celebration of her life was held in her honor Friday, Nov. 9, at Rebekah’s Children’s Services, a site where she spent more than 20 years passionately helping local youth. Villarreal was born in San Francisco Feb. 18, 1948. She died Oct. 28 at her Gilroy home with family members and husband, Raul Vega, after a two-year battle with leukemia. Villarreal was raised in Hollister and moved to Gilroy at 18. She attended Gavilan Community College and graduated from the University of San Francisco. Her passion was advocating for children and families in the South Valley. 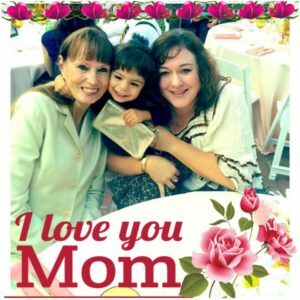 As an active supporter and member of the Latino community in Gilroy, she was a founding member of the Gilroy Hispanic Chamber of Commerce, the Gilroy Hispanic Cultural Festival and the Latino Family Fund. Last year, she received the Legacy Award from CARAS (Community Agency for Resources, Advocacy, and Services). 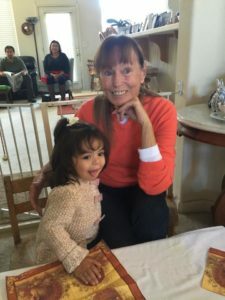 Eleanor Villarreal with her granddaughter Breea. Fundraising was a special talent for Villarreal and through her efforts RCS raised millions of dollars for the expansion of its programs. She was awarded the honor of Outstanding Professional Fundraiser in 1997 by the Association of Fundraising Professionals of Silicon Valley. In 2017, RCS named its library after her to honor her for her fundraising and other work. Throughout her life, Villarreal stayed involved in many Gilroy nonprofit organizations. She was a founding member of the Exchange Club of Gilroy and the Coastal Habitat Education Environmental Restoration (CHEER) group. She was a member of the South County Democratic Club. She served as commissioner for the Santa Clara County FIRST 5 program. She also served as chairwoman and a volunteer at the Gilroy Garlic Festival. In 1996, Villarreal received the Gilroy Woman of the Year honor. She also received the Lifetime Achievement Award from the Latino Family Foundation. Outside of volunteering, Villarreal enjoyed exercising, eating good food with friends, walking her dogs, dancing, finding items at antique shops and estate sales, and spending time with her children, Freddy and Nicole, and grandchildren, Selene, Breea, and Kiana. Villarreal’s legacy will be one of philanthropy, children’s advocacy, and community leadership, said her close friend Ernesto Olivares who worked with her in the Latino Family Foundation’s Youth in Philanthropy program. She helped in the group’s Tequila Tasting fundraising event held every May. As a person, Villarreal was highly regarded in Gilroy because her character and her integrity was always beyond reproach, he said. Despite her illness, she stayed involved volunteering. “Even when she was becoming weaker, she would respond positively to any request for support,” Olivares said. Karolinne Livingston got to know Villarreal through their work at RCS. They would often go to groups such as the Rotary and encourage donations. “Forceful” is the word Livingston used to describe her friend. Villarreal was kind by nature was fun to be around. 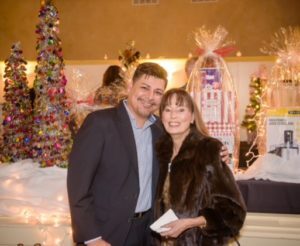 Villarreal was the “heart and vision” behind RCS’s annual Festival of Trees, which she began 16 years ago, said Claudia Sandoval, Rebekah’s fund development and community relations director. Friends of Villarreal, Jaime and Evelia Rosso worked with her on many projects through the years and saw her as a loving, caring and inspirational leader.